← Time capsules and the Port Memorial. While Bideford Library has marched boldly into the 21st Century with its Wi-Fi and e-book service, we shouldn’t forget the wealth of historical material also kept here. We have a wonderful set of old photographs and also an impressive collection of dusty old books relating to the history of Bideford and Devon more widely. It’s a shame that these aren’t used more, so this is the first in a series of occasional articles drawing your attention to some of the books that we feel deserve greater appreciation. The bulk of our collection was bequeathed to us by Richard Pearse Chope (1862-1938), a native of Hartland parish. He was a keen local historian and member of the Devonshire Association and regularly wrote articles for them and also the Hartland Chronicle. We have a run of the Chronicle from 1896-1931 and while they are fascinating to read, they are in poor condition so we have to be very careful when producing them. 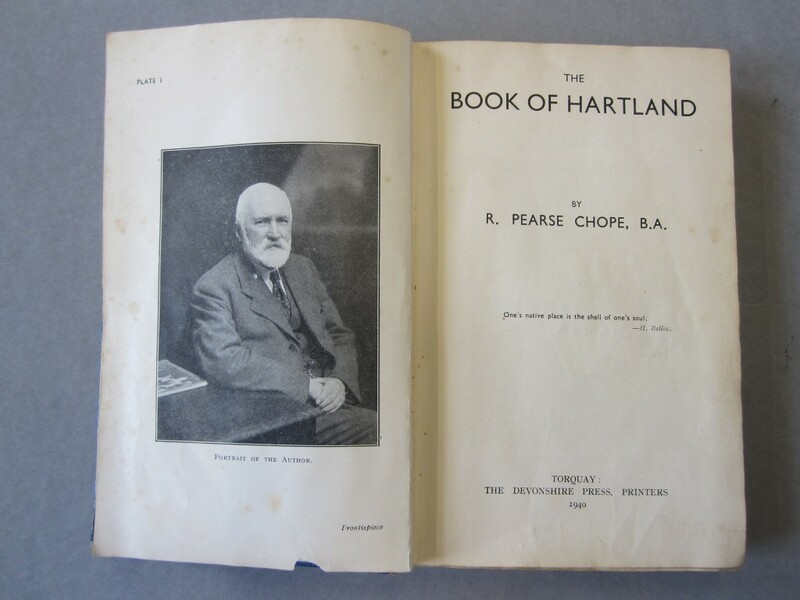 On his death, Chope left a nearly-completed book based on these articles so with some editing and minor additions, The Book of Hartland was published in 1940. The editor, Isobel Thornley from University College London, sadly also died shortly afterwards in an air raid so it was quite a troubled publication. Pictured is the title page and frontispiece showing the author looking very dapper with his neatly trimmed beard. Despite being a wartime production, the quality of the book is really quite nice. The paper is strong and retains its crispness and it is bound in a dark blue cloth. I haven’t been able to find out how many were printed but it must have been very few, probably numbering in hundreds. An acknowledgment at the front of the book thanks the Devonshire Association and 172 subscribers who financially supported the printing. Despite all this, the book is not really valuable. At the time of writing, there is currently a nice copy listed on ebay for £26! As the title suggests the book is concerned with the story of Hartland. It’s not a conventional history but a series of chapters, some of them only a few pages long, on a variety of topics from Saxon times until the 1800s. I’ll leave it to you to come and browse through the book, but my favourite chapter is a reproduction of the Borough Accounts from 1612-1807. This is a long list of payments made to travellers, soldiers, the poor and others. So for example in 1613 payments were made to watch Elloner Prust, presumably because there was no jail in Hartland. Also to provide ‘candells’ and bread while she was being detained and then to carry her to Exeter where the Assize Court would have been held. We wonder what Elloner did! There are still Prusts living in the area so maybe her descendants are among us. Elsewhere we read about ‘howses’ being burnt by ‘piratts’ and torn down by papists. In the seventeenth century most of the payments seem to have been made to Irish people. This was a time of famine in Ireland and also population being displaced by English Settlements. It seems that many of the poor Irish turned up in Devon where they received charity from the good people of Hartland. Please come and look through the book for yourself. It can’t be taken out from the library, but we also have a facsimile edition published in 1995 which can be borrowed. This entry was posted in Books, History and tagged Bideford Library, Chope collection, Hartland. Bookmark the permalink.